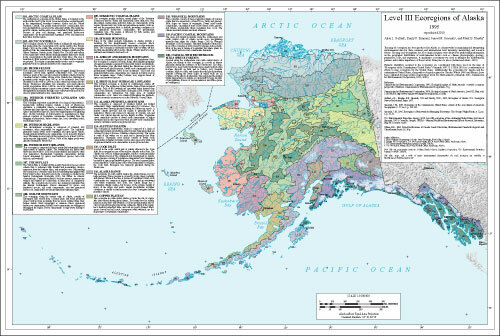 This map of ecoregions has been produced for Alaska as a framework for organizing and interpreting environmental data for State, national, and international level inventory, monitoring, and research efforts. The map and descriptions for 20 ecological regions were derived by synthesizing information on the geographic distribution of environmental factors such as climate, physiography, geology, permafrost, soils, and vegetation. A qualitative assessment was used to interpret the distributional patterns and relative importance of these factors from place to place (Gallant and others, 1995). Numeric identifiers assigned to the ecoregions are coordinated with those used on the map of Level III ecoregions of the conterminous United States (Omernik 1987) as a continuation of efforts to map ecoregions for the United States. Additionally, the ecoregions for Alaska and the conterminous United States, along with ecological regions for Canada (Wiken 1986) and Mexico, have been combined for maps at three hierarchical levels for North America (Omernik 1995, Commission for Environmental Cooperation, 1997, 2006). Comments regarding this map should be addressed to James Omernik, U.S. Geological Survey, 200 SW 35th Street, Corvallis, OR 97333, (541) 754-4458, omernik.james@epa.gov; or Glenn Griffith, U.S Geological Survey, 200 SW 35th Street, Corvallis, OR 97333, (541) 754-4465, griffith.glenn@epa.gov. Commission for Environmental Cooperation, 1997, Ecological regions of North America: toward a common perspective: Montreal, Commission for Environmental Cooperation, 71 p.
Gallant, A.L., Binnian, E.F. Omernik, J.M. and Shasby, M.B., 1995, Ecoregions of Alaska: U.S. Geological Survey Professional Paper 1567. Omernik, J.M., 1987, Ecoregions of the Conterminous United States: Annals of the Association of American Geographers, v. 77, no.1, p. 118-125. Omernik, J.M., 1995, Ecoregions: a Framework for Managing Ecosystems: The George Wright Forum, v. 12, no.1, p. 35-51. Wiken, E.B., 1986, Terrestrial Ecozones of Canada: Lands Directorate, Environmental Canada Ecological Land Classification Series 19, 26 p.